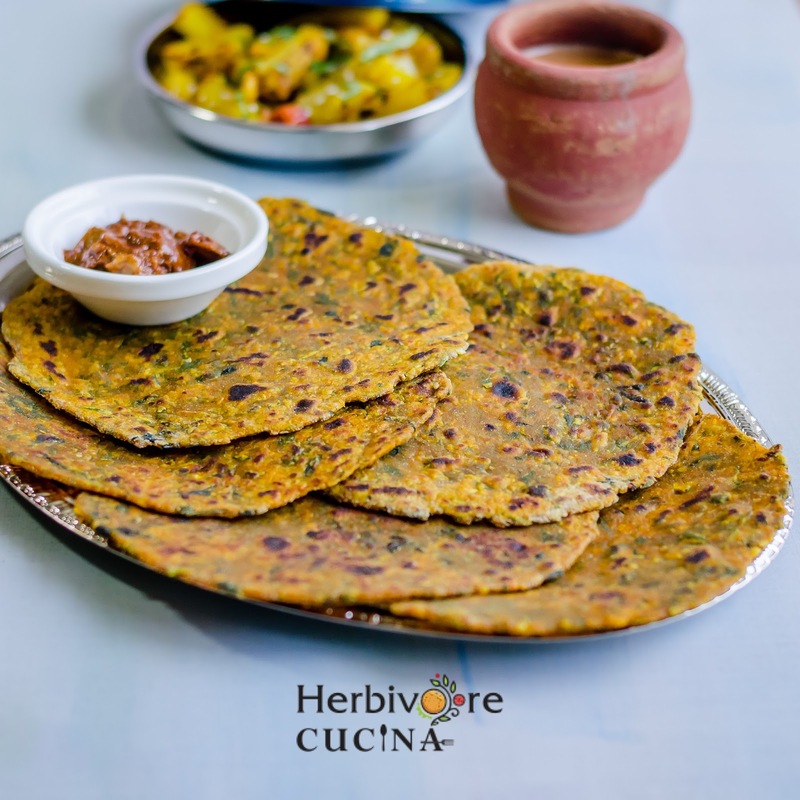 Easy to make flatbread with goodness of fenugreek greens. Serve these with potato bhaji, masala chai or yogurt and have a PERFECT meal! The theme for this week's Blogging Marathon is Picnic Recipes. 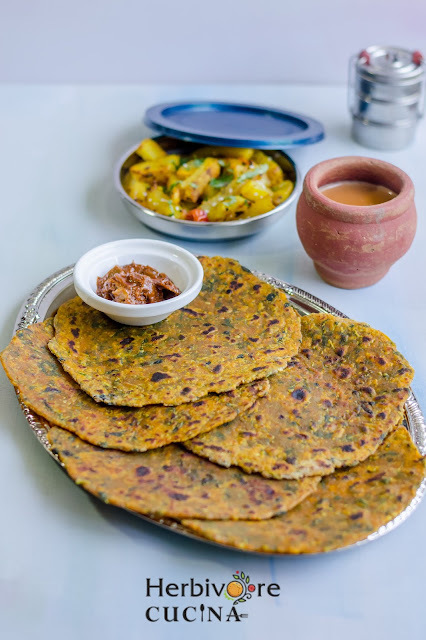 From all the recipes that are appropriate for the theme, Thepla fits the theme perfectly. 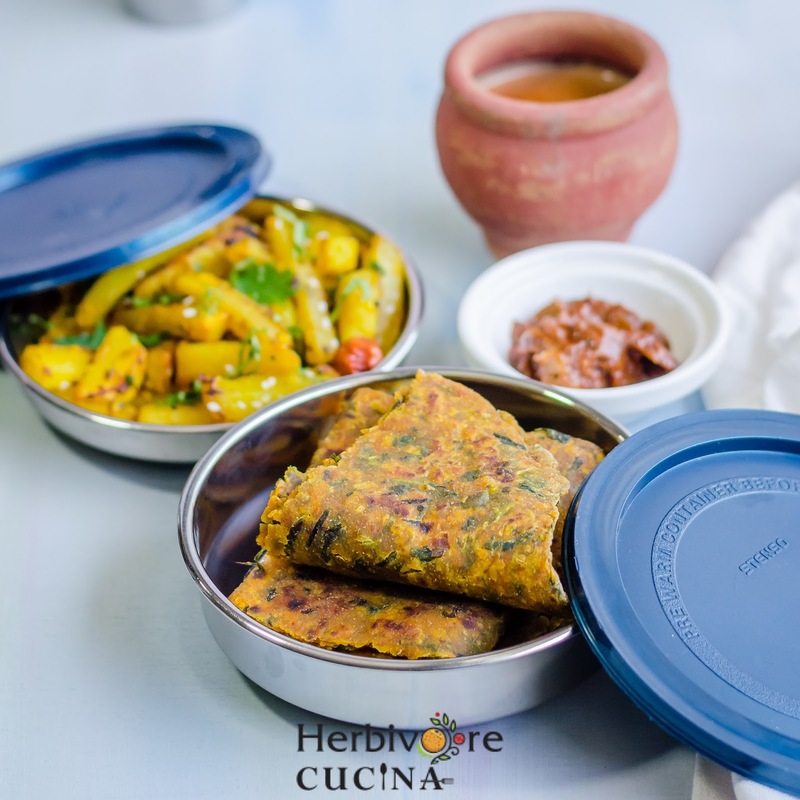 A Gujarati delicacy that will go on every trip we make! Whether it is a road trip, a day long picnic or a long train ride, thepla is always in the bag. Flatbreads made from wheat flour, methi leaves and spices; these theplas have a long shelf life. They taste awesome at room temperature or heated up; making them perfect for any trip. 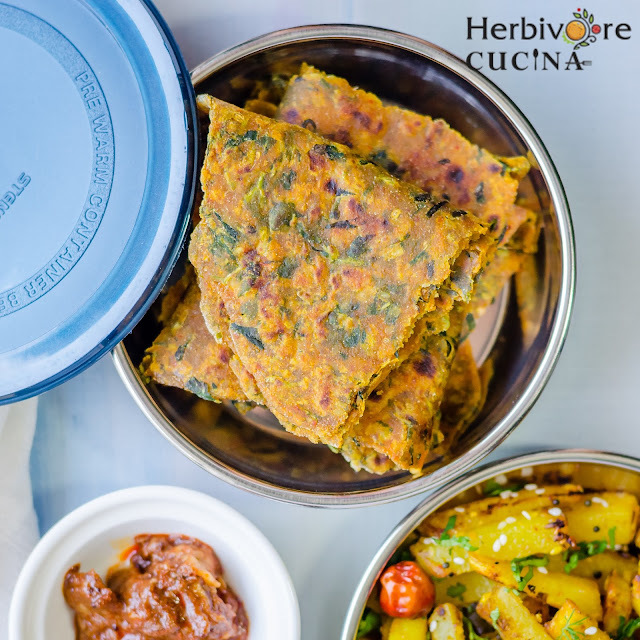 Plus, served with a cup of Masala Chai, this breakfast delicacy doubles as a yummy lunch or dinner option. When I was a small girl, I used to hate greens. Spinach, fenugreek, dill or any other greens were far away from my liking. However, I used to enjoy eating thepla with milk. So my mother and grandmother would make them very often just so that I would eat greens. Now I enjoy the greens on their own, but the love of thepla remains. While the traditional theplas are generally made from fresh methi leaves, I used to make them from Kasoori Methi (dried methi leaves) when the fresh ones were not available. However, lately the Farmer's Market in here now carry TONS of fresh methi and now thepla makes an appearance on our weekly menu! 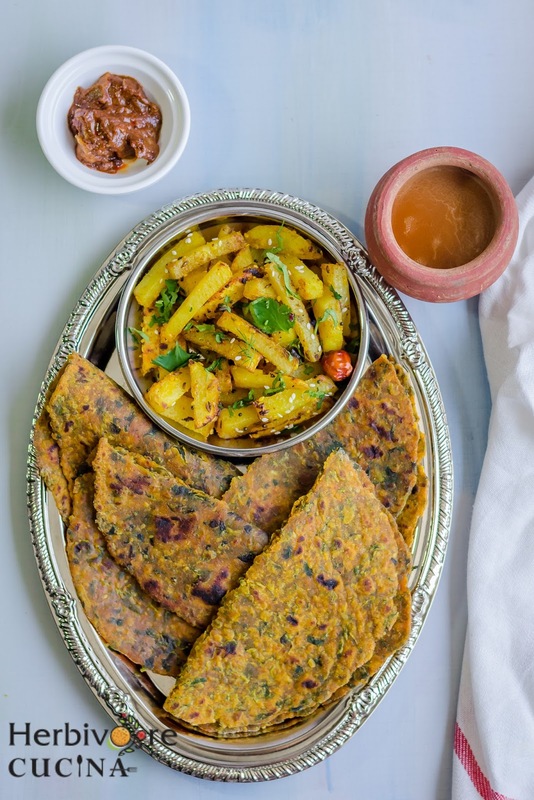 The vegetable that goes hand in hand with thepla is potato. This is the combination that travels across the world with us on every trip! The potato bhaji is made in different forms to be served with thepla. However, the version with LOTS of garlic and sesame seeds is my favorite. My grandmother made the BEST version of this bhaji. Plus, mango pickle and chai will complete the meal. When it comes to thepla, every family has a signature recipe. Some make it thick, some make them almost translucent. Some add cilantro and spinach too, others stick to just fenugreek. Another common difference is adding yogurt. Many people choose to leave it out and use just water to bind the dough. And yes, garlic is an ingredient that makes an appearance in some versions and are left out in the rest. It doesn't matter what variant of the thepla you make, it will become your favorite in no time. And once you are addicted to it, it is difficult to break away. 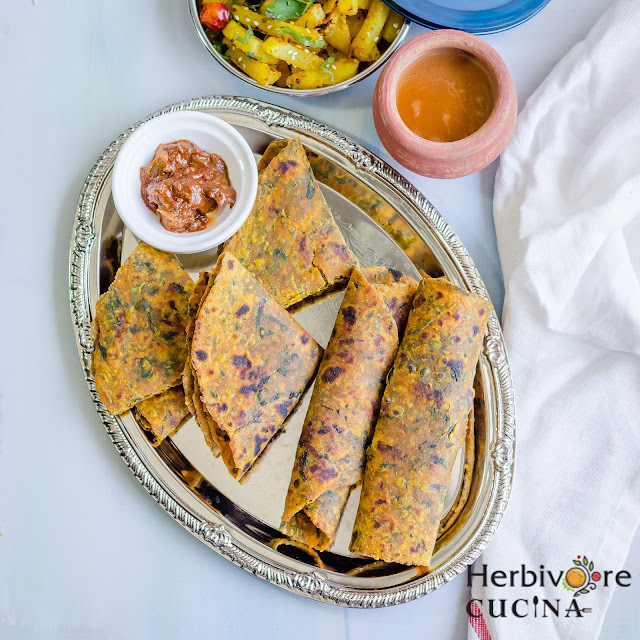 If you want another version of the thepla, don't forget to check out this Bajri Dhebra recipe. 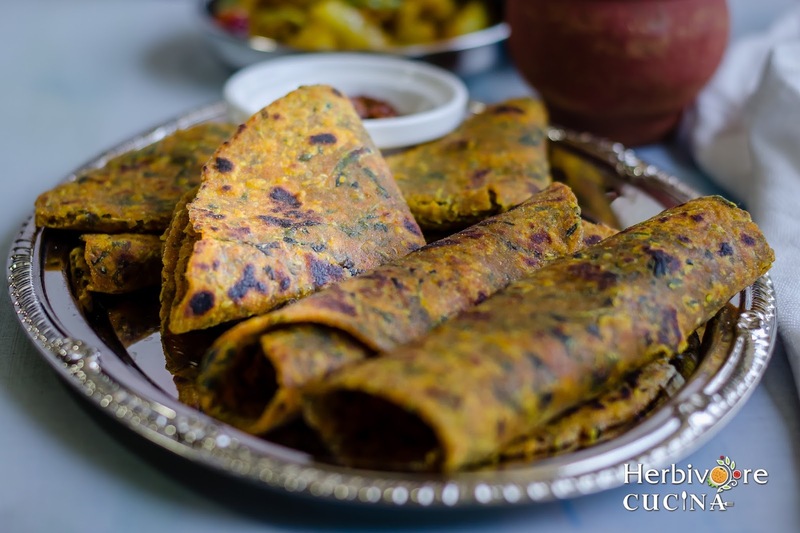 A close cousin of thepla, these are made from bajri (pearl millet) flour. Wash and roughly chop the fenugreek. Mix all the ingredients except oil in a bowl. Add 1- 1 1/2 tbsp oil and mix. Use some water (about 1/4 cup) and make a smooth and slightly firm dough. Let the dough rest for 10-15 minutes. 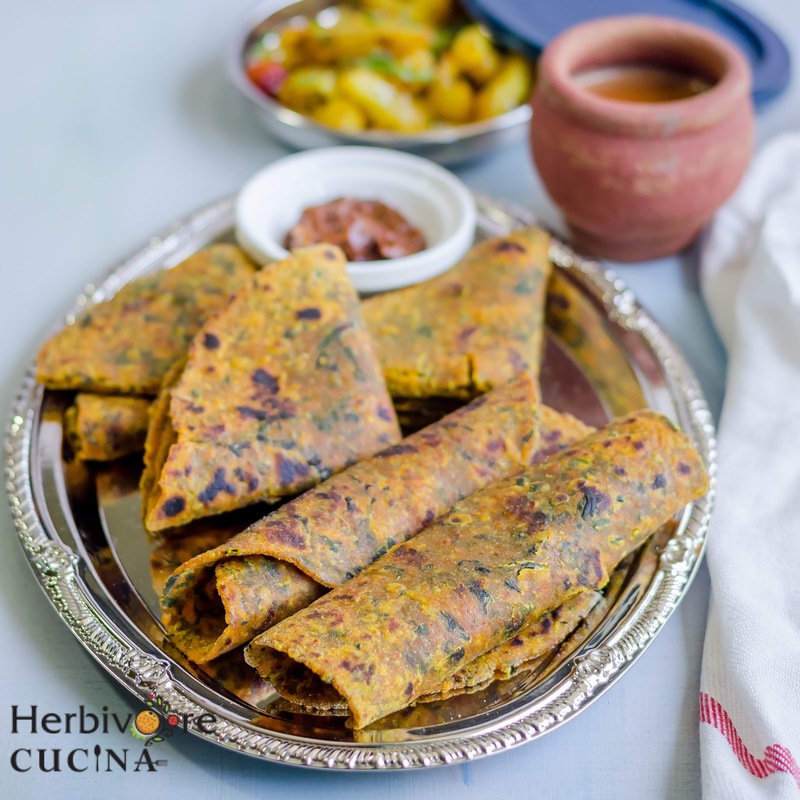 If the dough stands for longer, the methi will start leaving water and make the dough soft. Once rested, divide the dough into 5-6 balls. Using one part, make a smooth ball pressing in all the methi leaves. Flatten the ball and dust with dry flour. Roll out the dough to a round disc of 5-6 inches. Repeat for all the balls. Meanwhile, heat the tava and place one thepla on it. Cook on medium-low flame for a minute or two till bubbles start to appear. Turn it over, apply some oil and cook till spots begin to appear. Turn it over, apply oil and cook for a few seconds. Turn over one last time and remove from flame in a few seconds. Serve warm with a dry potato stir-fry, chai or yogurt and pickles. Better still, pack it all and take it on your next picnic! Check out the Blogging Marathon page to see what the other Blogging Marathoners are doing for this BM. Feel like enjoying those healthy theplas with some tangy pickle, so delicious. I remember a recipe which also added a ripe banana which gives a subtle sweetness to the theplas. 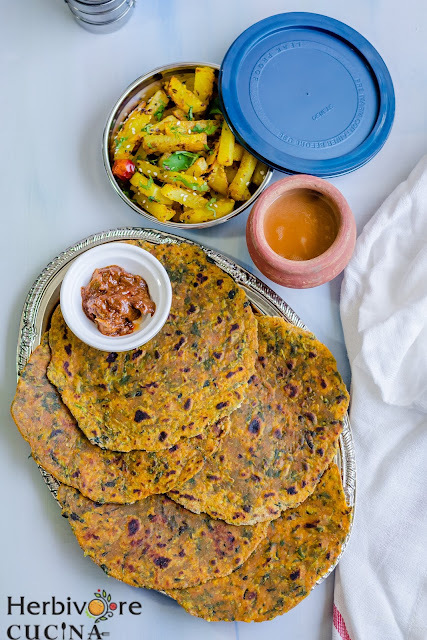 This version looks so good and is one of my fav flat breads..
Theplas are just the perfect dish to bring to picnics. Lovely clicks.